The world's first cane map - a rare novelty from the 1893 Columbian Exposition showing Buffalo Bill's Wild West Show. 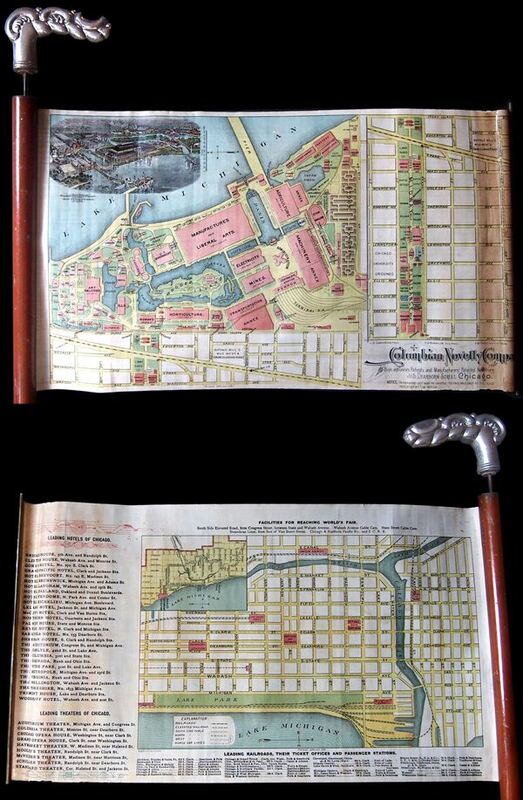 An extremely rare and unusual cane and map prepared in 1893 for the Chicago World's Fair or, as it is better known, the 1893 Columbian Exposition. This is the earliest known example of a cane map. The genre was invented by the Columbian Novelty Company and, as the map itself notes, the patent was still pending when issued for the fair in 1893. All subsequent cane maps, most of which date to the first half of the 20th century, follow on model of this cane as patented by the Columbian Novelty Company. The map extends from an internal spring loaded roller mechanism in the top of the cane. It is printed and hand colored on both sides. The primary side shows the grounds of the Columbian Exposition, now Jackson Park and the Field Museum, naming all important buildings walks, pavilions, markets, etc. Among the specific sites noted are 'Buffalo Bill's Wild West Show and Congress of Rough Riders,' the Chicago University Grounds, and the various pavilions established for manufacturing, mining, transportation, liberal arts, agriculture, machinery, etc. In the upper left quadrant there is an aerial view of the entire fair. A larger inset along the right hand side of the map focuses on the Midway from Stony Island to Cottage Grove. The 1893 Columbian Exposition or Chicago World's Fair was a pivotal moment in the history of the United States. Chicago won the right to host the World's Fair over New York, Washington D.C., and St. Louis. During its six month run, nearly 27,000,000 people attended the fair, which was roughly half the population of the United States at the time. Its numerous displays and exhibits established conventions for architecture, design, and decorative arts, in addition to initiating a new era of American industrial optimism. The layout and design of the fair, as seen here, is the work of Daniel Burnham and Frederick Law Olmsted, the genius behind New York City's Central Park and Brooklyn's Prospect Park, among others. Most of the fair was designed in the Beaux Arts tradition, a popular movement in Paris that was quickly gaining global momentum. In the years following the fair, this influential architectural style redefined the cityscape of Chicago, Boston, New York, and many other prominent American cities. Printed by August Gast of St. Louis for the Columbian Novelty Company of Chicago. Originally sold in the gift shops of the 1893 Columbian Exposition. The Columbian Novelty Company (October, 1891 - 1909) was a Chicago based organization established in expectation for the 1893 Columbian Exposition or Chicago World's Fair. The company's founders were John D. Brooks of Brooklyn, John W. Baker of South Orange New Jersey, and Fred W. Bingham of New York City. The Columbian Novelty Company, initially based at 315 Dearborn Street, Chicago, issued a number of novelty items related to the Worlds' Fair. Their business model was to acquire interesting patents or clever machines and gizmos and apply to them novelty factors associated with the fair. Some of their products included canes with roll out maps, slot machines, saddles, silvery and gold jewelry, etc. Following the Columbian Exposition the move around a bit with references to it in New York, Pennsylvania, and Nebraska. Little seems to have been manufactured following the turn of the century and the Columbian Novelty Company's Nebraska charter was officially canceled in 1909. August Gast (c. 1892 - 1900) was a printer and publisher active in St. Louis and New York in the late 19th century. Gast, though stylizing himself as a "map publisher" was mostly focused on bank note and revenue stamp lithography. Gast's business took off in 1893 when the Revenue Act of March 3 1883 repealed the two cent tax on checks and drafts. Consequently check and other bank notes no longer required an affixed revenue stamps, however, the public, familiar with such, proved suspicious of any such document that did not bear a official stamp. Thus a flourishing publishing business emerged in which bank and other documents were printed with semi-official "tax" stamps. Gast was one of the most prominent such publishers active in both New York and the Midwest. Good condition. The handle of the cane can be removed and the map extracted. The few examples of this cane map can we have come across are in poor condition, with numerous rips, tears, and other damages. This particular example stands well above the rest. The entire map is intact with some reinforcing tape at one end - see image. The map is attached to the brass pull at the opposite end. The map can be rolled into and pulled out of the cane with extreme care, but we do not recommend this – better to remove it from the cane entirely before examining it. We recommend mounting the map and cane as-is or removing the map from the cane for separate display. Measurement noted is for the map, the cane itself is about 30 inches in length.